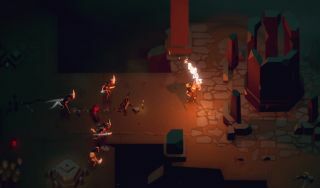 Capybara Games has released a brand-new trailer for its upcoming roguelike Below. We've also got a half-dozen new screens to look at, and perhaps best of all, a release window—not a date, but a step in the right direction—of this summer. It's been a couple of years since our hands-on with Below, but even then the game sounded wonderfully intriguing. Exploration is at the core of the experience, but you are not a terribly durable explorer, and as is often the way with roguelikes, combat will be very dangerous. It looks fantastic—not retro, like Capy's last game, Sword & Sworcery: EP, but very stylish—and, assuming the audio design hasn't taken a long walk off a short pier since we tried it (and this trailer suggests it has not), should sound great too. Below, in case you missed it above, is expected to be ready for release sometime this summer. Find out more at whatliesbelow.com.